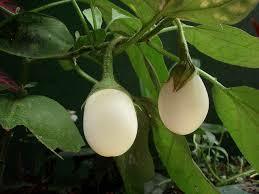 Stunning small egg shaped white aubergine, eggplant (Hence the name Blanche oeuf). This beautiful heirloom aubergine is almost pure white skin with creamy white flesh that is tender and very mild-tasting. Very productive plants keep bearing throughout a long season. The small white fruits grow in bunches and this plant is so ornamental it wouldn't look out of place in a flower border. Productive and early, a must try for 2016. Also suitable for growing in pots.